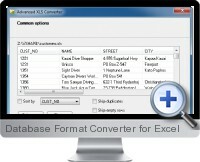 Excel Database Format Converter (Advanced XLS Converter) provides a fast and efficient solution for the conversion of XLS and XLSX files to a comprehensive range of database and text formats. The database conversion solution is ideal when Excel data is needed to be regularly imported into one or a variety of back end database systems. The conversion engine supports a large number of commonly used database formats including DBF dBase III/IV, Visual FoxPro, Clipper/Foxpro PRG, XML, Excel XLS/XLSX, CSV, SQL for Oracle/MySQL/MS SQL, RTF, HTML and text files. The simple database conversion wizard guides the conversion process by allowing choosing the source file and output format with associated options. The conversion process has been designed for fast performance and ability to process large Excel files without disruptions. Excel files can also be processed in batch conversion within one single process. Intelligent logic is embedded to port data structures correctly to chosen database formats and output can be previewed before executing the conversion. Advanced options allow data manipulation on conversion such as skipping duplicates, column sorting, filtering, filed type specification and size limits. Excel Database format converter does not require any external drivers to be installed and is compatible with all versions of Windows from 95 to 7 both 32 and 64 bit.